White kits, white kits, wherefore art thou? Question for Dave K... what is the status of Scalextric white kits? Specifically the new models like the Porsche 911 RSR and other GT cars. Are they going to be made? Asking because I would love to see the two retro liveried Porsche 911 cars currently running at Le Mans - the pink pig and the Rothmans* liveries. But if not, maybe a couple white kits and some paint and decals? *I know it's not actually labelled Rothmans. Does Scalextric make white kits for a Porsche 911 or RSR? 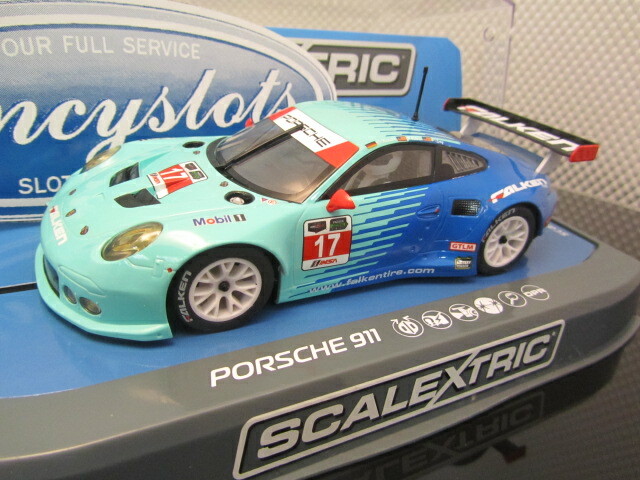 I have a scaly SuperResilant 911 and it does not look anything like the ones in LeMans. I wonder who, whom makes a more realistic looking RSR? Is REVOs car a RSR? There are no white cars this year. There is one planned for next year (the Monte Carlo). I'm not able to talk about "what might be one" beyond that... I know it's not very satisfying to hear that maybe but it's what I can say ATM. There are no white RSR cars. Thanks Dave. I respect the whole "need to know" thing. I just was wondering if there was one planned but hadn't really been publicly shared or I had missed it. Both of which are remolds and I can say the Falken Tire model works very well on wood. Hoping we see many more of these new molds in a variety of liveries, including the Pink Pig and "Rothmans". Rothmans and Pink Pig are a different body, unlikely Porsche would allow it without a whole new mold being made. I can't speak for anyone else but I wouldn't know what the subtle differences are between the Scaley 911 GT3 and the ones that just ran at LeMans and I would be very happy to have one painted in those liveries. I know there are detail freaks that wouldn't be happy with anything less than 100% accuracy but minor details like that hasn't stopped the manufacturers before. So the problem is that some real car manufacturers DO care about this Bob. The other problem is that we license everything we do. Which means that the real company have to sign off on the cars... every car.. . every livery. So in this case Porsche itself won't allow this from what I understand. They want a replica of the real car. So we're not able to do a "good enough for horseshoes and handgrenades" type of livery on the wrong body. This is why I do on and on about licensing... if you see a car without a licensing tag on it from a company it's been made outside a license. It has nothing to do with "the detail freaks" it has to do with the companies and what they require from licensees. And to be fair, the new Porsche is an entirely new car, all the way round, starting with the engine placement (mid). I will buy a couple of those when they come out - but I only want the right car! There will be a Thunderbird and a Monte Carlo plain white body this year. I've asked that they be produced in unpainted white plastic, they're not going painted in any way I'm told. They did this previously, you know! Several years ago, Hornby actually released 6 different white kit models, each of which could be assembled, painted, and decal-led just like any Airfix kit. Would look good on the shelf beside your Spitfire. But! These bodies also fit perfectly onto existing Scalextric slot car chassis. Here's one example, Hornby K 2008A AMG Mercedes CLK-DTM. Being as these all sold out, perhaps they'll consider revisiting the concept some time in the future?